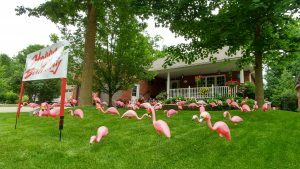 Lawn Ornaments – Party Supply Co.
Also available are the traditional pink flamingo offering we have had for 32 years. $1.50 ea. or if you wish us to get up early $90. We set up for you in town. We deliver! Call the team at the store 519. 273. 4353 or e mail partysupplystratford@gmail.com for your booking inquiry. 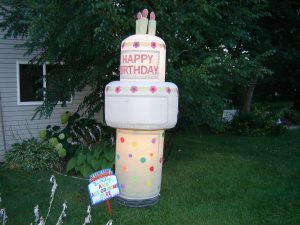 The Giant Lawn Cake lights up the evening and the morning with it’s light package inside. Just plug it in, stake it and go. 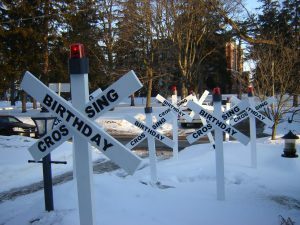 $38 or we will set up for you for $85. in town. Lights up the entire lawn.